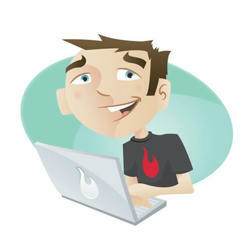 I came across this site that publishes answers to frequently asked questions to atheists or about atheism or about atheists. I decided to see if I can provide my own answers, so these are just my personal answers. 1. Can you prove that God doesn’t exist? A. How can anyone prove something doesn’t exist when it hasn’t been proven to exist in the first place? And it doesn’t work like that. Prove your god or gods exist. 2. What would it take to prove to you that a god exists? A. Proof. Solid proof. Not some quotes from a book or how many people believe in it or “look at the trees/baby’s smile”. And no amounts of threats will do the job either. 3. How do you know you are right? A. I don’t. That’s why I say I do not believe in your god. How can that be right or wrong? You say that a god exists and I don’t say that no gods exists, just that I do not believe because of a lack of evidence. 4. Why do atheists support gays so much? A. I don’t. I support every human who wants to his or her life without harming themselves or anyone else. Gays, LGBT, Transgenders – they deserve to be happy (same as you) and live their own lives (same as you) without you hindering/hurting/killing them. If they don’t harm you, how on earth does it affect you? 5. Have you tried to believe in God? A. Yes, my parents tried to indoctrinate me into their religion, same as yours probably did and for a while it worked. Then I turned 13 and started questioning. At the age of 19 I became an atheist. I still don’t believe that any god exists. 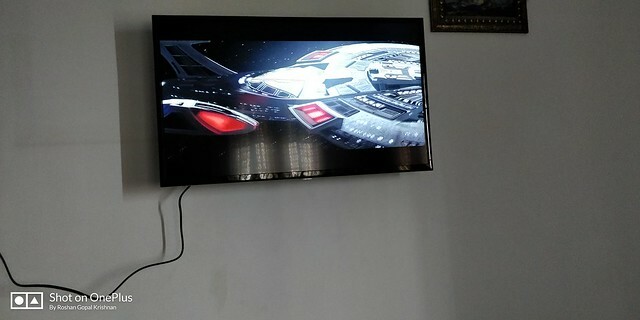 Here is my current setup – the MI LED Smart tv 4A 32 inch. I just bought it and it was delivered and installed 3 days ago. Solo: A Star Wars Story (or simply Solo) is a 2018 American space Western film based on the Star Wars character Han Solo. Directed by Ron Howard, produced by Lucasfilm and distributed by Walt Disney Studios Motion Pictures, it is the second Star Wars anthology film following Rogue One (2016). Alden Ehrenreich stars as Han Solo alongside Woody Harrelson, Emilia Clarke, Donald Glover, Thandie Newton, Phoebe Waller-Bridge, Joonas Suotamo, and Paul Bettany. 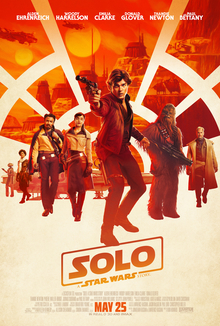 The plot takes place approximately ten years prior to the events of A New Hope, and explores the early adventures of Han Solo and Chewbacca, who join a heist within the criminal underworld. When you look at it one way, it’s a movie about when Hanny Met Cheewy! LOL, I could not resist. Anyway, what’s with the prequels that is bogging down scifi these past few years. Lovers Han & Qi’ra who grew up together as orphans on Coreilla, escape from the clutches of a local gang. They bribe an Imperial officer with stolen coaxium, a powerful hyperspace fuel, in exchange for passage on an outgoing transport, but Qi’ra is apprehended by their pursuers before she can board. Han vows to return for her and joins the Imperial Navy as a flight cadet. When the recruiting officer asks for his surname, Han says he is alone with no family, so the recruiter gives him the last name “Solo”. 3 years later, due to insubordination he is now an infantry man fighting on Minban. He meets conmen & smugglers Tobias Beckett, his wife Val & Rio Durant who are posing as soldiers and he is dumped into a pit to be eaten by a beast when he almost rats them out. The beast turns out to be Chewbacca (who eats humans apparently) and he speaks in Woookie language to join forced and escape. Beckett, impressed by Han’s resilience, lets the two on board and enlists them in the gang to steal a shipment of coaxium on Vandor-1. The plan goes awry when the Cloud Riders show up, led by Enfys Nest, resulting in the deaths of two crew members, Rio Durant and Beckett’s wife Val, and the destruction of the coaxium. Knowing his bDryden Vos, a high-ranking crime boss in the Crimson Dawn syndicate. Han and Chewbacca volunteer to help him steal another shipment to repay the debt. They travel to Vos’ yacht where Han finds Qi’ra, who has joined Crimson Dawn and is Vos’ top lieutenant. Han suggests a risky plan to steal unrefined coaxium from the mines on Kessel; Vos approves but insists that Qi’ra accompany the team. She leads them to Lando Calrissian, an accomplished smuggler and pilot who she hopes will lend them his ship. Han challenges Lando to a game of sabacc, with the wager being Lando’s ship. Lando cheats to win but agrees to join the mission in exchange for a share of the profits. After reaching Kessel in the Millennium Falcon and infiltrating the mine, Lando’s droid co-pilot L3-37 instigates a slave revolt. In the confusion, they steal the coaxium, but L3 is severely damaged and Lando is injured during the escape. With the help of L3’s navigational computer, hotwired into the ship’s systems, Han pilots the ship through the dangerous and uncharted Kessel Run to elude an Imperial blockade. The Falcon, badly damaged, lands on the planet Savareen to process the coaxium. Lando flees in the Falcon. Enfys explains to Han that she and her crew are not pirates, but rebels trying to prevent the syndicates and Empire from gaining power. Han becomes sympathetic to their cause and tries to trick Vos, but Beckett has already alerted him to the double-cross. Vos sends his guards to kill Enfys, but the Cloud Riders overpower them instead, leaving Vos defenseless. Having anticipated Vos’ strategy, Han tries to take the coaxium, only for Beckett to betray Vos, escaping with it and taking Chewbacca hostage. Qi’ra kills Vos and sends Han after Beckett; once alone, she contacts Vos’ superior, Maul, to inform him of the mission’s failure and claim Vos’ position. She avoids speaking of Han’s involvement, instead blaming everything on Beckett. Han catches up to Beckett and confronts him, shooting Beckett before he can return fire. With his dying words Beckett tells Han he made a smart choice. Qi’ra leaves in Vos’ yacht, while Han and Chewbacca turn the coaxium over to Enfys, who then offers Han a chance to join the rebellion against the Empire; when he declines, she gives him a vial of coaxium, enough to buy a ship of his own. Han and Chewbacca locate Lando and challenge him to a rematch in sabacc, once again wagering the Falcon. Han wins, having stolen the card Lando was keeping up his sleeve in order to cheat, and he and Chewbacca leave for Tatooine, where a “big-shot gangster” is putting together a job. Altogether it felt like a movie put together to show “hey, here is where Han got the Falcon, here is where he met Lando and how Chewbacca became his side-kick”. High praise for Woody, who is always good, and Emilia Clarke who is awesome too in her role. 7 outta 10! Crystal Palace captain Luka Milivojevic scored twice from the penalty spot to earn his side a dramatic draw and end Arsenal’s 11-game winning run. The Serb smashed in a late equaliser after Pierre-Emerick Aubameyang’s controversial goal had put the visitors ahead after the break. Milivojevic scored the opener in the first half after Shkodran Mustafi brought down Cheikhou Kouyate. Granit Xhaka’s sublime free-kick had drawn Arsenal level at 1-1. Wilfried Zaha was brought down by Xhaka in the box with seven minutes to go and Milivojevic drilled his spot-kick into Arsenal keeper Bernd Leno’s right corner, having also beaten him on that side in the first half. Earlier in the second half, the ball appeared to brush Alexandre Lacazette’s hand before it fell at the back post to Aubameyang, who poked home off the inside of the post – with the ball going over the line by just 9mm. Before his error in bringing down Zaha to give away the late penalty, Xhaka’s stunning curler had cancelled out Milivojevic’s opener – which was Palace’s first goal at home this season. Zaha also hit the outside of the post before the break, while Andros Townsend dragged a shot wide. Palace substitute Max Meyer struck over the bar from close range later in the second half and Alex Iwobi’s deflected shot flew wide. Arsenal remain fourth in the Premier League table, a point behind Manchester City, while Palace move up to 14th and three points above the relegation zone. Cheesy Chicken Burger at Burger Hutz with a Vanilla shake and French fries (with mayo). Chicken patty with onions, cheese, tomato and for some reason they add ketchup to the burger. Shake is an average vanilla shake, good french fries (for this kind of a joint). Perhaps in the coming 100 years or so things change and the governments of the world invest in technology that will eventually clean up our planet and we end up with a “paradise like” earth, as seen in Star Trek. 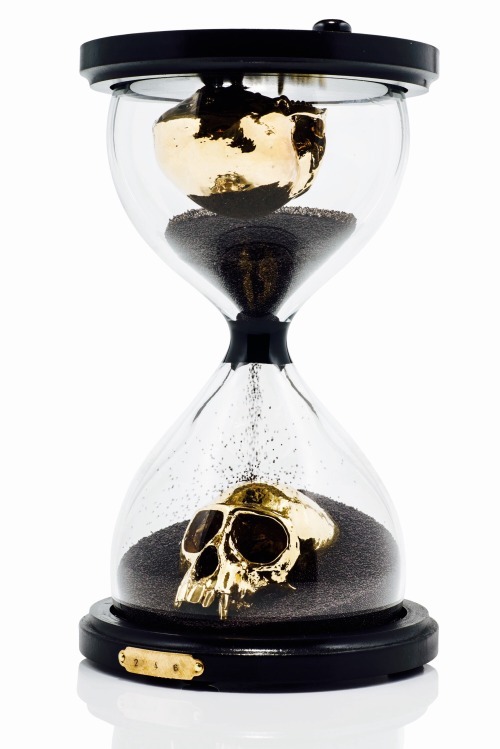 But again – science fiction right – it does not look likely. Unless we get that done, the best option for humans and animals is that we find another planet/moon or planets/moons where it is either already suitable for earthlings or we can terraform it (if such a technology can exist) and we can start afresh. There is a reason I say planets or moons for us to find and settle on. So I have to work today, a Saturday. While most of my colleagues and team members are at home and enjoying their weekend, because of a mistake someone else made, I have to work this Saturday and the next. Imagine that! Scheduling mistakes led to this. Hence the current training batch I have assigned to me were given Tuesday and Wednesday off and I took only Tuesday off. Now I have to work along with the 27 new hire employees today and on the 3rd, meaning 6 days next week, because of this. Ain’t life grand! I was planning a movie marathon for this weekend, watching stuff on my new tv and getting some beer, some pizza or fried chicken and really enjoying my weekend but this week and the next the plan is out. Well I have the tv installed. I spoke to the installation guy this morning at around 10:30 am while I was drinking coffee and he came here by 11 am. 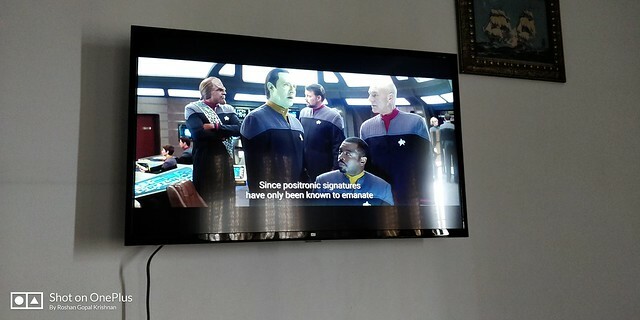 It took an hour to install the tv on a wall mount and show me how to connect to the internet (normally using wifi but since I don’t have wifi, I opted to connect the tv to my phone’s hotspot. I installed a couple of apps for Youtube & Hotstar via the aptoide tv app for Android televisions. This works out great. But my very first act was to check on playing movies via a thumbdrive and ofcourse I picked Star Trek as my very first movie to run on it. It looks great. Well this is where the new tv is gonna go. As you can see from the outline, I used to have a painting there. Well not a painting but a 3D image of two birds inside a large frame. That has been moved to the living room. This wall is now almost blank now, except for the small painting on the right and the switch board on the left. Pretty soon my new tv is gonna be mounted there. Well the tv is here. It was on time and all that. So I ordered the tv from Flipkart on the 11th of October and the delivery date was given as the 24th. 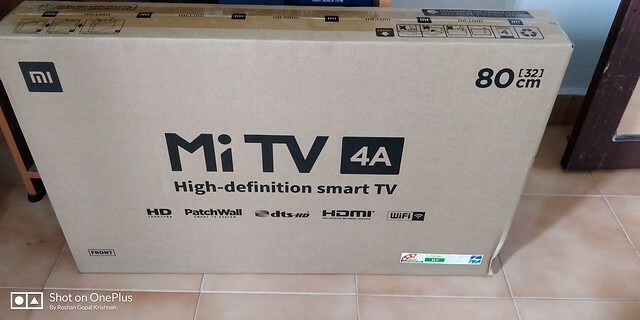 Which was yesterday and sure enough, in the morning at around 11 am I was sent a message saying that “your order for the Mi TV is out for delivery”. The guys delivered it at around 1:30 pm and about 90 minutes later I received a call from the local support company that Flipkart has and the lady on the phone asked me if I got the package. I said I did and could you arrange the installation for the next day – today – between 11 am and 3pm since I have to leave by 3:30 pm to go to work. And now I await the installation guy. Mix the pork in a bowl with the ginger, garlic, garam masala, chili powder, tumeric, chillies, mint and coriander. Cover and refrigerate overnight. The next day, put the sliced onion in a colander, sprinkle with salt to draw liquid out of the onions. Discard liquid, rinse onions and pat dry. Heat oil and butter in a dutch oven, then fry onions until golden brown (about 10 minutes). Remove onions and drain. Pour off and reserve all but about 2 tbsp of the butter and oil. Fry the pork in the dutch oven until well browned. Add cooked onions and yogurt and cook on low for 40 minutes. In a large saucepan, boil enough water to cover rice. Add rice, return to the boil, and cook 5 minutes. Drain rice, spread on top of onions and pork in dutch oven. Drizzle with lemon juice, saffron/milk mixture, and the leftover butter and oil. Preheat the oven to 425 Fahrenheit. Make a dough by adding a little water to the flour and 1 tsp salt. Roll dough into a long, thin sausage shape, and press along the top rim of the dutch oven. When the lid is placed on this dough, it will form a seal between the lid and base of the dutch oven. Cook sealed dutch oven on high heat for 5 minutes before transferring to oven. Bake in oven for 40 minutes. Remove from oven, break dough seal and enjoy. 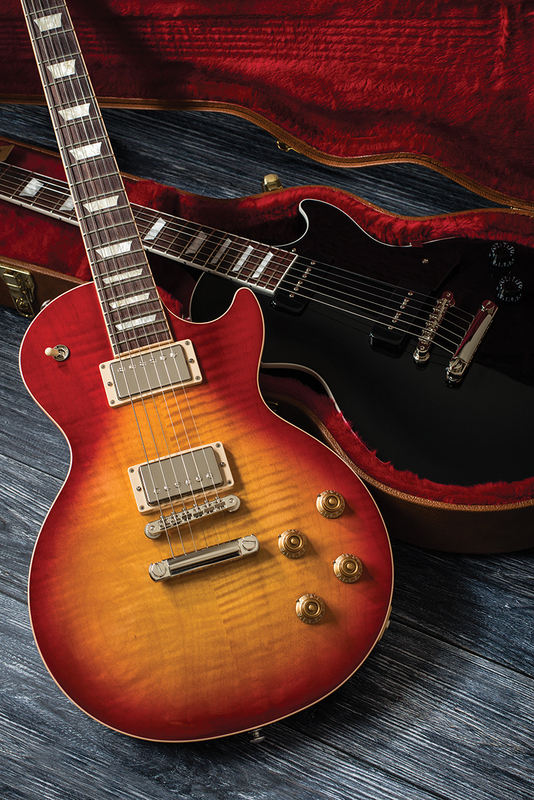 Gibson 2018 Les Paul Traditional Heritage Cherry Sunburst nitrocellulose & Gibson 2018 Les Paul Classic in Ebony nitrocellulose. The monsterous Double Decker burger at Kahawa Cafe – a middle bun, smaller patties, fried eggs, tomato, onions, 2 slices of cheese, lettuce with French Fries and Peanut Butter & Chocolate milkshake to wash it down. That was extremely filling and totally worth it. The milkshake is awesome and I will order that many times. Well I have finally done it! I have dipped my toes into the dvd collection world and made my first proper purchases of dvds. So, usually I would get pirates copies (what are sold as dvds but are copies with cheap print outs of the dvd covers) and the Torrents ofcourse, like most of India and the developing world does. But things have changed a lot since then. Now we have legal options for downloading or streaming movies like Sony LIV, HotStar, Amazon Prime or Netflix. While those are getting really popular and are available for less money on a monthly or yearly basis, I still crave the physical media. So on checking prices for movies on dvd online in both Flipkart and Amazon India, I finally made my first 3 purchases. I wanted them to be from the original movie series but it’s still Star Trek and that’s fine in my book. So I bought the Kelvinverse trilogy movies of Star Trek (2009), Star Trek: Into Darkness (2013) and Star Trek Beyond (2016) on a great deal. They are individual cases and all that, though I do remember seeing a box set I think. But these are for great prices on a limited deal. Infact, I could have gotten it even cheaper had I placed the orders last night. But I waited till morning and thus lost the Star Trek Beyond dvd that was selling for a cheaper rate. It’s gonna be slow and I won’t be able to afford to buy many dvds on a monthly basis but I will build my collection. Blurays are out of the question for now. But someday that too will be easier to buy.